Section 2: This organization is incorporated as a nonprofit corporation under the laws of the state of Arizona. Section 3: The business address of AIPA shall be a site chosen by the Board of Directors, with consideration to both continuity and convenience. Section 1: To promote interest and engagement in the field of scholastic journalism in the state of Arizona, especially at the high school and junior high school levels. f. Exchange of such materials as newspapers, yearbooks, and instructional media and equipment. Section 3: To develop the sense of responsibility that is basic to the First Amendment rights of freedom of the press in student publications, and to promote an understanding of the rights and responsibilities of the press in both school and community. Section 4: To foster a closer relationship among students interested and engaged in scholastic journalism. Section 5: To encourage journalism study and instruction and to support students and advisers in this endeavor. Section 6: To improve the caliber of journalism instruction and increase the professional status of its member teachers and advisers. Section 7: To work in cooperation with national, regional, state and local educational journalistic associations and institutions to further those objectives held in common. Section 1: The Arizona Interscholastic Press Association is not organized for profit. Section 2: Any compensation for services rendered to AIPA must be approved by a two-thirds vote of the Board. Section 3: No substantial part of the activities of AIPA shall consist of propaganda efforts, or otherwise attempting to influence legislation, unless those efforts deal with scholastic journalism issues and are approved by the Board of Directors. Section 4: The AIPA shall not participate in nor intervene in any political campaign on behalf of any candidate for public office. Section 5: The Association shall not have the power to issue capital stock. It shall be a membership corporation. Membership in the Association shall consist of active, associate, lifetime and honorary categories. Section 1: Active members shall consist of teachers in any secondary school, (public, private, charter or parochial), accredited by the Arizona State Department of Education, who formerly or currently advise student media. Membership shall be registered in the name of the individual publication. Section 2: Associate, lifetime and honorary membership may be provided as specified in the by-laws of AIPA. Section 3: Active or associate membership shall be maintained by payment of membership dues and shall be contingent upon the payment of those dues. Section 2: Officers will be elected to a two-year term by the membership on or before April 30, except for student representatives, who serve a one-year term. Section 3: To carry on the business of the Association, there shall be a Board of Directors, consisting of the above-named elected officials, as well as board members ex-officio: Summer Workshop Director, the Arizona State Director for the Journalism Education Association, and the Past President. Section 4: There shall be such standing committees as may be designated in the by-laws, and such special committees as may be appointed by the President with the approval of the Board of Directors. Section 1: The Board of Directors shall have the responsibility to set the time and place of the fall and spring conventions. Section 2: Special meetings may be called by the Board of Directors. Section 3: A quorum for a general meeting shall consist of the active members present, if all members have been duly notified. A quorum for a board meeting shall consist of one-half plus one of members of the Board of Directors. Section 1: The Board of Directors may choose a site (such as a university, college, community college, high school or professional organization) as the home base of the Association. The purpose of such a home base will be to facilitate Association business — and may serve as a site to maintain records and at which to hold board meetings and conventions. Section 2: The host organization shall have no vote in the business of AIPA. Section 3: The Board of Directors may change the home base when it is beneficial to the Association to do so. Section 4: The Board of Directors may appoint an Executive Secretary from the host organization to help facilitate Association business. Section 1: This constitution may be amended at the fall or spring meeting of the Association by a two-thirds vote of the active members present. Section 1: Active membership shall be open to current and former advisers and their publications as specified in Article 4 of the Constitution. Each adviser’s publication is eligible for membership and subject to the requisite dues of membership and has voting privileges. A former adviser is eligible for membership and subject to the requisite dues of membership and has voting privileges. Section 2: Associate membership shall be open to junior colleges, colleges and universities, photographers, yearbook representatives, publishing companies, and other media-related organizations upon approval of the Board of Directors. Associate members pay dues but do not vote or hold office. Section 3: Honorary membership may be bestowed upon persons who have made major contributions to scholastic publications and journalism education and are recognized by action of the membership at the fall or spring meeting. The Board of Directors nominates honorary members. Honorary members do not vote, hold office or pay dues. Upon election to honorary membership, a suitable citation will be presented to the honorary member. Section 4: Lifetime membership may be awarded to any active or former AIPA member at the discretion of the board. Lifetime membership may be bestowed upon persons who have made major contributions to the Arizona Interscholastic Press Association and are recognized by action of the membership at the fall or spring meeting. The Board of Directors nominates lifetime members. Lifetime members do not vote, hold office or pay dues. Upon election to lifetime membership, a suitable citation will be presented to the lifetime member. Section 1: The annual dues for active membership shall be set each year by the Board of Directors. Section 2: Annual dues for associate membership shall be set each year by the Board of Directors. Associate membership conveys vendor &/or display booth privileges at AIPA functions. Section 3: Payment of dues is required before members may exercise their vote at the fall or spring meetings or participate in such activities as contests Summer Workshop. Section 1: The President shall: . Preside at all meetings of the Association membership or Board of Directors. Recommend for consideration of the Board of Directors such measures as seem expedient for the best interests of AIPA, provided they do not conflict with the constitution or by-laws. Appoint chairpersons of special committees with the approval of the Board of Directors. Be a member, ex-officio, of all committees standing and special. Supervise all activities of the Association, working in cooperation with directors and chairpersons of such activities. Collect a written annual report from each board member and committee chairperson, prior to the spring meeting. A copy of each report is also to be retained in the records of the office or committee and thus available to the incoming director or chairperson. Write letters to school officials as necessary. 1. Perform all duties of the President in this person’s absence. 2. Assist the President as requested. 3. Oversee membership, and the maintenance of membership records and the Association database. 4. Submit a written annual report to the President at the spring meeting. 1. Record and store, faithfully and accurately, the minutes of all meetings of the Board of Directors and the membership. If possible, the Secretary will tape-record the business of the meeting in addition to making notes. 2. Submit copies of minutes to all active members. 3. Carry on correspondence as directed by the President and the Board of Directors. 4. Submit a written annual report to the President at the spring meeting, including a summary of board resolutions and major actions. 1. Maintain the Association website and all official and important documents. 2. Oversee consistent distribution of Association information, including mailings. 3. Promote Association events through press releases. 4. Submit a written annual report to the President at the spring meeting, with a copy to be included in the files for successive communication directors. 5. Carry on correspondence as directed by the President and the Board of Directors. 2. Maintain accurate financial records. 3. Prepare yearly budget report. 1. Obtain a site and date for the fall and spring conventions, subject to the approval of the Board of Directors. 2. Represent the Association in the signing of a contract for the site of the convention. 3. Be responsible for the physical arrangements and the program of the convention, subject to the Board’s approval. 4. Appoint a committee from the membership to assist with the convention. 5. Obtain suggestions for the following year’s convention, including site and content. 6. Submit a written report to the President at the spring meeting, with a copy to be included in the files for successive convention coordinators. 7. Present a convention budget to the Board of Directors for approval. 1. Be responsible for AIPA-sponsored educational activities for present and prospective publication advisers, with board approval. Such activities may include courses co-sponsored by AIPA in cooperation with associate member colleges and universities, and ‘in-house’ sessions organized and presented by AIPA separately from or in conjunction with conventions. 2. Appoint a committee from the membership to facilitate such activities. 3. Submit a written report to the President at the spring meeting, with a copy to be retained in files for successive coordinators. 1. Be responsible for developing a budget, planning curriculum, scheduling classes, handling discipline, hiring the faculty and staff, securing room and board and arranging for insurance. 2. Present the workshop budget to the Board of Directors for approval. An account will be set up for Workshop Directors, who must be accountable with receipts for all expenses incurred. 3. Report to the President and the Board of Directors by the first fall board meeting with a written report, including a financial statement written in conjunction with the Treasurer. 4. Appoint an Assistant Workshop Director, with the approval of the Board, if the need arises. 5. The Summer Workshop Director is a board member of AIPA ex-officio. 1. Serve as an adviser to the President and to the Association at large. 2. Maintain corrected copies of the constitution and by-laws. 3. Serve as a chairperson for the Nominating and Elections Committee to prepare a slate of nominees for office and to present this slate to the membership for voting. 4. Submit a written report to the President at the spring meeting, with a copy to be retained in files for the successive Past Presidents. 5. Recognize retiring members with letters of commendation. 3. Submit a written report to the President at the spring meeting, with a copy to be retained in the files. Be in charge of organizing, conducting, setting the dates for, and writing the rules for AIPA journalism contests. Be in charge of obtaining judges, determining winners, announcing results, and presenting awards for these contests. Submit a written report to the President at the spring meeting, with a copy to be retained in the files for successive coordinators. Appoint a committee from the membership to assist with the contest. Section 12: The Board of Directors may appoint a representative of AIPA to the Journalism Education Association (JEA) to serve as a director for the state of Arizona in JEA. The JEA Director is a board member of AIPA ex-officio. The JEA Director serves as a liaison between AIPA and JEA. The JEA Director will report to the Board of Directors and President, with a written annual report to be submitted to the President at the spring meeting. Follow the directives of the President and the Board of Directors. Have no vote on the AIPA Board. Maintain close contact with the President and Treasurer. Attend the fall and spring conventions, and other board meetings as deemed appropriate. Be paid an annual salary as specified by the board. Be actively involved in journalism at the host organization. Be actively involved in scholastic journalism. Represent students’ perspectives and needs, and advise the Association in its activities. Section 1: Committee chairpersons have power to appoint committee members. Section 2: Committee members may serve one year and be reappointed at the discretion of the incoming chairperson, with recommendation of the outgoing chairperson. Section 3: The nature and scope of the work to be done by any committee will determine its size. Section 4: Special committees may be appointed as needed by the President with the approval of the Board of Directors. The term of the chairperson shall be for the duration of the project. The committee will be discontinued upon the completion of the project, or at any time deemed necessary by the Board of Directors. Section 5: The President is an ex-officio member of all committees and shall be notified of their meetings and progress. Section 1: The elected officers of the Association shall consist of President, Vice-President, Treasurer, Recording Secretary, Communications Director, In-Service Coordinator, Fall Convention Coordinator, Board Members At-Large, Spring Convention Coordinator, Contest Coordinator, Past President, and student representatives. The Summer Workshop Director shall be appointed by the Board of Directors each fall. Other board members ex-officio are the State JEA Director and the Past President. Section 2: To hold office, a member must be, or must have been, actively involved in the production of public, private, charter or parochial secondary school publications. Broadcast and media teachers are included in this category. Section 3: The administration of the business of AIPA shall be vested in the Board of Directors, which shall further be authorized to take whatever actions it deems necessary for the best interests of AIPA, provided that none of these actions conflict with either the constitution or the by-laws of AIPA. All Association activities are subject to Board review and approval. Section 4: In the event of the resignation of any board member, or the vacancy of a board position, for any reason whatever, the vacancy shall be filled by a vote of the Board of Directors. Such appointment shall be made within one month and shall be effective until the end of the unexpired term of office. Section 5: Removal from office: A petition by a majority of the general membership or by a two-thirds vote by active members can initiate the removal of an elected officer. An elected official shall have five business days to resign the position following notification of the intent to vote for removal from office. Removal will occur with approval of two-thirds of the members of the Board. A board member may be removed after missing three consecutive meetings. Section 6: Meetings of the Board of Directors shall be called by the President whenever the need arises, but at least four times during the year. Section 7: The President shall act as chairperson of the Board and shall not vote, unless required to do so to break a tie vote. The Vice-President shall act as chairperson in the absence of the President. Section 1: The membership year shall be from July 1 of one year to June 30 of the next year. Section 2: The fiscal year shall be from July 1 of one year to June 30 of the next year. This will allow the Treasurer to close the books and report to the Board of Directors and to the membership in the fall. Section 1: All officers shall serve for a term of two years, commencing immediately after the annual election. 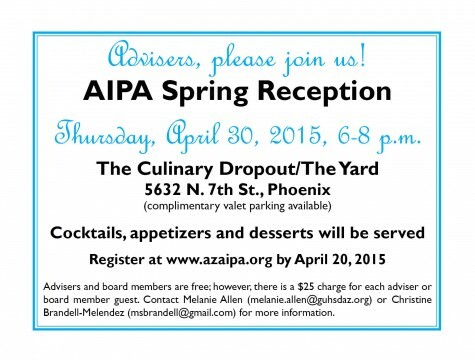 The AIPA Board of Directors election will be held in April. All officers may be reelected to office. During odd-numbered years the following officers shall be elected: President, Vice President, Recording Secretary and odd-numbered Board Members At-Large. During even-numbered years the following officers shall be elected: Communications Director, Contest Coordinator, In-Service Coordinator, Treasurer, Convention Coordinators and even-numbered Board Members At-Large. Section 2: Voting for officers shall take place by mail. If one adviser serves two school publications, and dues are paid for both publications, that person is entitled to two votes. Section 3: A simple majority of votes received will be sufficient to elect. Section 4: A Nominations and Election Committee headed by the Past President will be appointed each year. The Committee will include the Past President and two other members at large. The committee will present a slate of nominees for each elected office. Nominations for unfilled positions may also be made from the floor. The Past President shall notify all member schools of the election and opportunity to nominate student representatives before the spring convention. Students must be sophomores or juniors in good standing with an active member school/publication. All students wishing to run must notify the Past President two weeks prior to the spring convention. Each candidate will be given three minutes to speak at the opening session of the spring convention. Elections shall start at the end of the opening session and continue until the end of lunch. Each member school shall have two votes, one vote representing the students and one representing the adviser. Each member school shall vote for one yearbook student representative and one newspaper student representative. Section 1: Amendments to the AIPA Constitution may be proposed by the Board of Directors and by the membership. A member wishing to propose a constitutional change must present the proposal to the Board of Directors in writing, three months prior to the date of an AIPA convention meeting. Section 2: A two-thirds vote of the active members present at the fall or spring convention meeting will be required to amend the constitution or by-laws. Section 3: The Board shall conduct a periodic review of the constitution. Make your school an AIPA member today!